Cool Buck Classic Slot Review - Casino Answers! 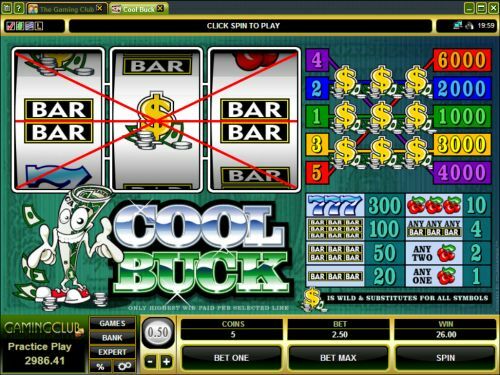 Cool Buck is a 3-reel, 5-line classic slot machine developed by Microgaming, featuring a wild symbol. You can play the Cool Buck classic slot machine at Bovada. The Cool Buck casino game is a quarter slot. Coin sizes available on the Cool Buck slot machine are $0.25, $0.50, $1, $2 and $5 per line. You can select up to 5 paylines. Casino Answers recommends that you play the 5-line maximum bet all times (by using the “Bet Max” button) to be eligible for Cool Buck’s highest payouts. You can bet up to the maximum total bet up to $25 per spin. To play the Cool Buck online slot, select your bet and press the “Spin” button to spin the reels. The top-paying symbol on the Cool Buck slot game is the Dollar Sign symbol. If you hit 3 Dollar Sign symbols on line 5, you will win the 6000 coin top jackpot. In order to win the Cool Buck classic slot’s top jackpot, you will have to play the 5-line max bet. Other other paylines, this winning combination will award you with lesser payouts. The Dollar Sign symbol is wild and will substitute for all other symbols in Cool Buck. You can win 6000X your bet playing the Cool Buck online slot at Bovada! There are 9 winning combinations on the Cool Buck classic slot machine. The complete payout schedule is as follows (1/2/3/4/5 line payouts in parenthesis when applicable): 1 Cherry symbol (1), 2 Cherry symbols (2), any 3 Bar symbols (4), 3 Cherry symbols (10), 3 Single Bar symbols (20), 3 Double Bar symbols (50), 3 Triple Bar symbols (100), 3 Seven symbols (300) and 3 Dollar Sign symbols (1000/2000/3000/4000/6000). If you want to make a cool buck, you can do it by playing the Cool Buck classic slot game! You will find the Cool Buck online slot at Microgaming casinos like Bovada. Can USA players play the Cool Buck slot game for real money? No, American players cannot play the Cool Buck slot machine for real money. Instead, you can play at Rival-powered online casinos like Bovada. Is there a Cool Buck flash game available that I can play for free? Yes, you can find the Cool Buck flash game at Microgaming flash casinos. You can play for free or real money. If you have any difficulties playing the Cool Buck fruit machine in your browser, we suggest download the newest version of Adobe Flash Player. You can find play the Cool Buck flash game at Bovada.